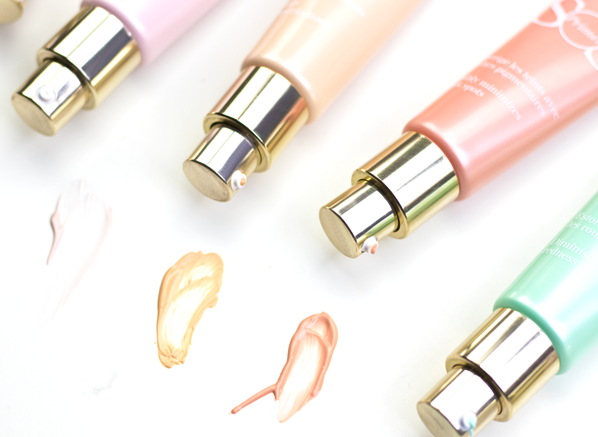 The Clarins SOS Primers are all about the three c’s: concerns, colour and confidence. Unlike other makeup bases, this colour-correcting primer does a lot more than smooth your skin before foundation. A makeup and skincare hybrid in one, this rainbow array of instant pick-me-ups are ready to tackle any and every concern, regardless of skin tone and texture. What does the Clarins SOS Primer do? Which Clarins SOS Primer is for me? 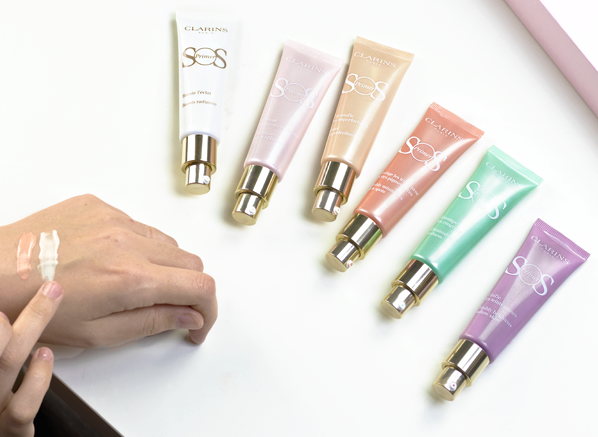 If you have no major concerns apart from looking to brighten and lift skin, the SOS Primer in 00 Universal Light will be your perfect match. More shimmering than others in the collection, its glowy-white formula delicately adds an immediate healthy finish to skin that’s in need of a boost. Top tip: Focus the application of the Universal Light SOS Primer on the high points of your face for an enhanced luminous look. Tired skin? Look no further. The SOS Primer in 01 Rose uses the power of pink pigments to restore freshness to your look, which is perfect for those burning the candle at both ends. If you smoke, live in a polluted area or, maybe, poor diet has taken an effect on your skin, a dose of the rose primer will go a long way for you, with or without makeup. Top tip: For an extra boost, pat the Rose SOS Primer underneath the outer corners of your eye area for an instant awakened look. Those with acne scarring and pigmentation on their skin will benefit from using the SOS Primer in 02 Peach, as its brightening apricot shade will magically counteract any violet tones (think dark circles and purple veins). Cushiony and non-drying, this softening primer smooths over irregular texture too, providing your foundation with softer results that last. Top tip: Apply the Peach SOS Primer underneath the inner corner of your eyes and around your nose to disguise shadowy areas. If you suffer from dark spots, the SOS Primer in 03 Coral will be the primer you need to help balance light and dark tones in the skin. Similar to the Peach SOS Primer, but more targeted towards blue tones in the skin (such as bruises and the undertone of dark spots), the orange pigments of the coral primer adds a soft clarity the complexion, which is then boosted when you apply your favourite coverage foundation. Top tip: Target the application of the Coral SOS Primer along your jawline and the base of your chin to balance out any uneven areas. Rosacea, acne, spicy foods… the reasons for redness in the skin are endless, but if calming the appearance of flushes is the most important issue that you want to control, the SOS Primer in 04 Green will be the ideal priming partner for your concern. Dressing your skin in a light wash of diffusing colour, visible redness such as capillaries and blemishes are reduced with this primer. Please note: If you suffer from inflammatory acne or rosacea, the SOS Primer won’t act as a preventative or cure. Top tip: Apply the Green SOS Primer to your cheeks and around your nose and blend outwards. This will diffuse the appearance of flushes and veins. Sallow skin can actually make you look older than you are. With tell-tale signs showing a yellow/ brown undertone on your complexion, the brightening powers of the SOS Primer in 05 Lavender will lift away dullness. If you’re anaemic, vitamin deficient or you’re slacking in the skincare department, this primer is the one you need! Top tip: Focus the application of the Lavender SOS Primer to the forehead and chin to restore overall radiance to your skin. How do I use the Clarins SOS Primer? If you have more than more concern: Cocktail the SOS Primers together to create your perfect canvas. This entry was posted on Monday, February 12th, 2018 at 8:30 am and is filed under Make-up, Skincare, Swatches, Trends, Tried & Tested. You can follow any responses to this entry through the RSS 2.0 feed. You can skip to the end and leave a response. Pinging is currently not allowed.